a good life. : twenty-four weeks. bumpdate! let's hear it for v-day!! yes, we've reached that magical week where if i was to go into pre-term labor, doctors would do everything they could to save my little boy. however, at twenty-four weeks this little man only has approximately a 60% chance of surviving & about a 75% chance of suffering serious medical complications when he did, so let's not hope for labor anytime soon. he needs to stay in at least another thirteen weeks & get himself fully baked. but still? pretty awesome that this baby in my belly is actually possibly capable of living outside the womb now. makes him much more human-like, ya know? and as he starts to move & hiccup & kick a whole lot more, i find myself getting more & more & more excited for him to come out. i really wonder what he's gonna look like & if he's gonna be anything like parker or if he's gonna be a whole new ballgame. parker was a super mellow baby & has been a pretty mellow toddler so everyone says this one is gonna be a hellian. please tell me that's not how it works! i'm starting to remember how moms get through labor & those first few weeks. it's because you get so uncomfortable towards the end of your pregnancy that you would do anything to get that baby out & then you're just so happy to have an outside baby you're willing to do anything to keep them happy, am i right? not that i'm to that point yet, but as the belly grows & pings of sciatica race down my leg, it's starting to come back to me. i am so so so grateful to be pregnant & so excited for every single baby kick & milestone but y'all? pregnancy is hard. and i'm sure i'll have to post a couple times about that. no one ever says it's not worth it, but yeah... it's hard. that's all i'm sayin'. well, this is our last day in san diego. we fly back today & real life starts back up tomorrow. i did a real crappy job of taking pictures with my big camera but took a ton with the iPhone. just so much easier, ya know? plus the last couple days were pretty overcast & there weren't really any great beach/sunset/amazing scenery photo-ops so whatcanyado? but we've been having a blast & no one is ready to go home. it's been an awesome little vacay for our last as a family of three & it's crazy to think that if we go somewhere next spring it'll be as a family of four. crazy & exciting. that being said... it's time for me to go squeeze every last bit of vacation out of each minute before we leave so wish me luck for safe travels back to seattle! oy. indeed, I do remember the end of my pregnancy. def the hardest part. BUT genius biology there, you're correct. make us so miserable we figure out some way to deal with labor and delivery! but let's not talk about that for a while, eh? :) safe travels home. and happy viability week! wow! you look amazing! so glad to hear your trip has been so fun! vacations are always the best!! I love your updates! Those are going to be so neat in a printed book! I'm glad you've enjoyed your vacation as a family of three! love the baby hiccups! You look amazing! 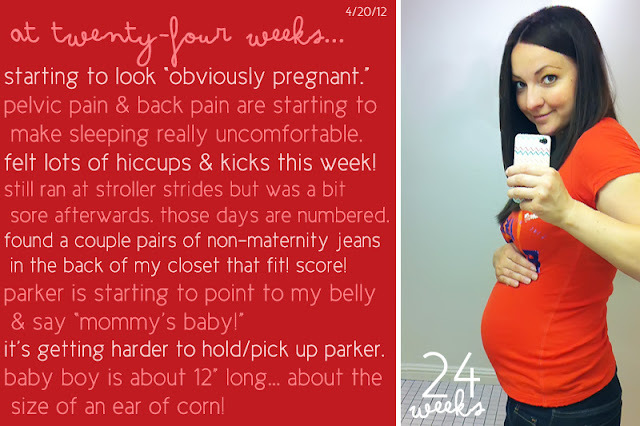 24 weeks! Booya! That's a good milestone. And your bump? CUH-UTE! And dude, you're so right about pregnancy being hard. I wrote a post a few months ago about how hard I thought it was- but of course I followed it up with how it's absolutely worth all of it! We think so much alike, it's crazy. I feel like you take the words right out of my head sometimes. You have a good point, that the end of pregnancy is so hard that it almost makes the newborn days seem easy! I admire you for being so fit...and don't understand how you and so many other pregnant gals fit into non-maternity jeans! That's always the first thing to go for me...my arse/hips explode when I'm pregnant! Love the comment about how much easier it is to take iphone pictures than to get the nice camera out! I totally identify, but then I kick myself when I upload them and they're all grainy! Your bump is too cute! So fun that Parker is pointing to your belly and recognizing a baby is in there! He is going to be such a good big brother!! You're such a cute pregnant person! Glad you guys are all having fun. And props for going to stroller strides still! I would agree that it's time to slow down and let Parker walk & not be carried. You are in great shape but it is hard on your back to do all that lifting... just sayin'. Great update; you look great! You certainly look amazing considering the weeks already! How do you do it? My mates and I from chiropractors in Brisbane, Australia can help but adore your pictures. Stay fab and glam! Cheers.